. . . this blogger who wants to inspire our culture’s imaginal cells, those who dare to live as if it’s normal to talk with trees and hear the stars sing. She was named Deborah Jane Milton by her parents. Her Father’s parents were born in Sweden and England. Her Mother was proud to claim to be a Daughter of the American Revolution and her ancestors came generations earlier from England, Ireland, France and Germany. Deborah earned a Ph.D. in Human Development a long time ago and calls herself a visionary artist, eco-psychologist, and inspirational mentor. She is also a mother of four and grandmother of eight and it is for them that she writes this blog. 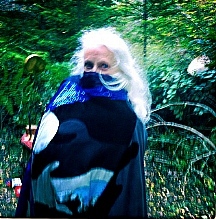 In 1992, she spent two months in solitude on Hornby Island in the Salish Sea. She used that time to transform her identity from one of being a psychotherapist to one of calling herself an artist. Solitude, dreams and the natural green and watery world around her worked that magic. Since moving to an island near Seattle after 30 years in Montana, she’s been re-inspired by that same watery world and finds herself experimenting with juicy watercolor on”claybord”. Now after taking a transformational online art class called BIG in the Spring of 2012, she’s riveted by charcoal pigments and acrylic paint on large canvasses. Though most posts here are filled with her imagery and she chronicles her experience in BIG starting with March 2012 posts, she has a new blogsite devoted exclusivly to her art. Please check it out and don’t hesitate to contact me if you have an interest in purchasing something. In 2001 she founded Athanor Arts, a small retreat center, which she nurtured for a decade living in the midst of the Montana wild and the presence of wild creatures. Here now in the Pacific Northwest she grows new relationships to snow capped mountains, convoluted rain forest, surging sea and co-creative, passionate cohorts, animating the youthfulness of her aging. She still serves as an athanor – the alchemical furnace which holds a steady state of heat conducive to transformation. She offers classes in art and creative inspiration, BodySinging, and Ecstatic Wisdom Postures. She inspires others to discover their unique gifts and to use them in service of the evolutionary shift in human identity being called forth by the planet.